CBT Training and Motorbike Riding Lessons. You can read all about us on facebook and twitter. View students of A-Class Driving School who have passed car test, HGV test and bike tests too. Follow and like us on facebook and tweet to your friends on twitter about the successes you have with us. A-Class CBT Motorbike Riding Lessons is a Driving Standards Agency Approved Training Body providing Motorcycle Training in Chatham, Rochester, Gillingham, Medway and all over Kent. We provide the highest quality motorcycle training because we are thorough, patient, enthusiastic and fully qualified. Our bikes are of good quality and regularly maintained so our trainees can have total confidence in their bike during training. Whether you are a novice rider wishing to take your Compulsory Basic Training (CBT) or a more experienced rider wanting to take your motorcycle test, we offer all types of Test Training so whichever route you choose, we have a training package for you! We also provide improver courses at post CBT and post test level so you can really get to grips with today's road and traffic conditions and really enjoy your biking. Training is conducted in a friendly and professional manner and paced to suit you. If you have concerns about taking your motorcycle test.. then please don't! We are a DSA approved motorcycle training school offering flexible,safe and fun courses. We have high caliber instructors with high pass rates. Get into the saddle and celebrate the spirit of adventure. Train with the best and maximize your skills and your potential as a safe, solid rider.. and of course, pass the test. 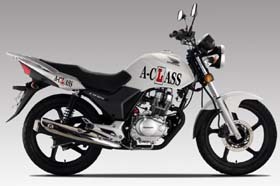 Why choose A-Class CBT Motorbike Riding Lessons? Economical - unrivalled rates in Chatham & all of Kent. Flexible - open 7 days a week, offering Compulsory Basic Training (CBT) and direct access training for a full motorcycle license. Safe - all motorcycles & scooters are carefully procured and serviced up to manufacturer's requirements. Helmets, gloves & waterproofs provided if required. Credible - DSA qualified site & DSA qualified instructors. Above, average pass rates & over 30 years riding experience to ensure your training will be successful,fun and safe. Fun - celebrate the spirit of adventure.